South Austin swimming holes are the best! If you’re looking to cool off this summer, check out one of the south Austin swimming holes. From the Barton Creek Greenbelt to Barton Springs, there’s something for everyone! Twin Falls, Sculpture Falls and Campbell’s Hole are all Austin swimming holes located in the Barton Creek Greenbelt. This means they rely on rainfall to fill up, so it’s best to wait a few days after a solid downpour to visit. This is definitely one of the best south Austin swimming holes. When full, there’s enough water to swim and the waterfall is spectacular! Park along the South Mopac Access Road, just south of 360. Follow the Barton Creek Greenbelt Trail for about .5 miles until you arrive at Twin Falls! 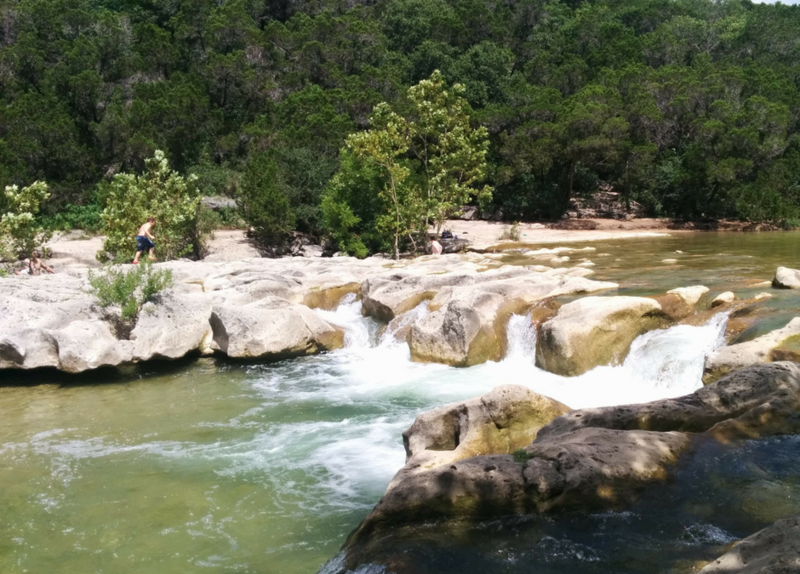 Sculpture Falls is another gorgeous Austin swimming hole. It’s located about 1.2 miles past Twin Falls on the same trail. Much larger than Twin Falls, it also often has less people. There’s a rope swing, plenty of swimming areas, and sometimes there’s a tightrope stretched across the water! Campbell’s Hole is yet another fantastic Barton Creek Greenbelt swimming hole. To get there, park near the Tacodeli on Spyglass and follow the “Stretch and Stroll” Trailhead .4 mile to Campbell’s Hole. Be sure to hang a left where it meets up with the Barton Creek Greenbelt Trail. Get there early, as the springs fill up in the afternoon. Located just below Barton Springs, “Barking Springs” is so named because of the plethora of dogs that frolic in the waters here. However, Barking Springs is a popular Austin swimming hole with anyone who wants to enjoy the cool waters of Barton Springs without paying an entry fee. Be sure to wear water shoes as the rocks are slippery! Want to move to south Austin so you can enjoy the south Austin swimming holes anytime? Apartment Experts South can help! Give us a call at 512-416-8111 to find your dream apartment absolutely free!